I WANT TO INSERT A SERIES OF NEW WORKSHEETS WITH A MACRO. HOW CAN I TELL IF THE WORKSHEET NAME ALREADY EXISTS IN THE WORKBOOK? The ExistsSheet procedures developed in this page use the Sheets.Name property to find if a worksheet or chartsheet name already exists in the workbook. If the name cannot be found, then the sheet does not exist. A Worksheet or ChartSheet object is a member of the Sheets collection. To return a single sheet, use Sheets(index), where index is the sheet name (section 1 - code 1) or index number (section 2 - code 3). Suppose that Sheet1 is a tab name in the workbook, then the expression Sheets("Sheet1").Name returns the name Sheet1, if not, it returns a Run-time error '9', Subscript out of range error as shown in figure 1. In code 1, the custom function ExistsSheet uses an On Error Resume Next statement to disable the error-handling routine and suppress the run-time error message. When this is done, the Sheets.Name statement in line 3 of the code returns Empty in the case when the name does not exist. If the statement Sheets(InName).Name = Empty is TRUE, then the sheet does not exist and ExitsSheet returns FALSE. If the statement is FALSE, that is, not empty, then the sheet does exist and ExistsSheet returns TRUE. The TestExistsSheet procedure in the code 2 frame demonstrates the ExistsSheet function. You can change the TestSheet variable in lines 5 and 6 to try different sheet names. MsgBox TestSheet(i) + " exists." MsgBox TestSheet(i) + " does NOT exist", vbInformation, "xlf ExistsSheet"
The output is sent to two consecutive message boxes. 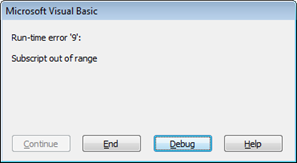 In VBA the concatenation operator is the & character, the same as Excel, but VBA also allows use of the + operator for concatenation of text strings, as shown in lines 9 and 11 of code 2. By using the index number, rather than the name, we avoid triggering Run-time error '9'. The For...Next loop in code 3 only calls the Name property of existing sheets.